The Drunken Severed Head: DEVIL MUSIC ENSEMBLE tours Europe! DEVIL MUSIC ENSEMBLE tours Europe! Similar to the DME event pictured above, the Voodoo Queen and I saw the talented musical group DEVIL MUSIC ENSEMBLE perform an original score at a local screening last year. 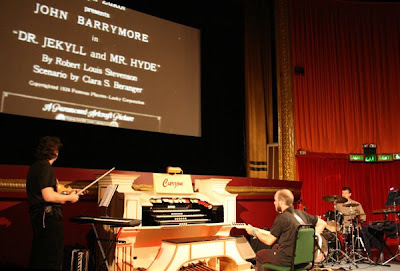 They accompanied a showing of the 1920 film version of "Dr. Jekyll and Mr. Hyde." For the European readers of this blog, I recommend you see them as they tour this summer. Below is an announcement and calendar they sent me for their tour across the Old World. Look it over, then plan to go see this classic film-- one of the best versions of Robert Louis Stevenson's schizoid story-- with DME's live accompaniment. You will be glad you did. Please pass this along to your Euro friends...Thanks!